Once upon a time, I was a house/dog sitter. When folks with animals traveled out of town, they contacted me to stay at their place and take care of their animals. One of my clients was a woman with a dog named, Lina. I loved when Lina’s owner went out of town, because Lina was one of my favorite pooches to visit. Lina and I became very close. When Lina’s Mom was given an opportunity to relocate to Massachusetts for work/school, she asked me if I wanted to adopt her. I literally jumped at the chance, and Lina became MY Lina. Lina had fancy tricks she could do on command. For instance, when you took Lina outside all you had to say was “Lina, go vote”, and Lina would go pee or poop. True story. Lina was also famous for her – ahem – gas. She had the ability to pass gas without making a sound, but the knowledge of the gas would be obvious to everyone in the room within seconds. During a camping trip, five of us (plus Lina) were gathered around a campfire. We were in the midst of a conversation and suddenly everyone (but me) shot up and ran to the other side of the campfire. True story. Apparently Lina, who was sitting quietly next to me, had just passed gas. Yep, Lina could clear campsites with her gas. Did I mention Lina was a Rottweiler? Lina was a Rottweiler. She was the nicest Rottweiler ever placed on the face of this earth, of that I am certain. Lina liked cats, too. When she and I were living in an in-law suite, the owners of the house had two cats. One of the cats was named “Deaf Kitty” because she was deaf. (Creative name, eh?) Deaf Kitty always came to visit Lina. She would nudge her face on Lina’s muzzle, and she would follow her around the yard. I never tired of seeing Lina and Deaf Kitty together. Their relationship was special. My friends and I would be hanging out in the living room with both dogs. Then we would give the dogs a sock, and we would watch as Lina and Bud played tug. Of course, when a Rottie is playing tug with a Jack, the Rottie pretty much stands there while the Jack growls and hops left to right, trying desperately (and in vain) to pull the sock from the mouth of the Rottie. Bud was always up to the challenge, and Lina was always willing to stand there patiently. I may have seen Lina laugh at Bud a few times, but I cannot be too certain. Lina was with me for 8 yrs, and many of my friends were fortunate enough to meet her. She had the ability to make friends with non-dog lovers. Really. She knew no enemies, and everyone she met left as a friend. Lina traveled with me to DC two or three times, while I spent time with friends. She visited happily with Shiloh the cat and Mickey the dog. My friends always opened their doors to Lina. Shortly after Rob and I were married, we rescued 7wk old pups named, Wilbur and Cherokee. Lina welcomed Wilbur and Cherokee into our home, and she put up with the young pups, as they hopped all over her and nibbled on her ears. When Rob and I were trying to start a family of humans, I was nervous. I was genuinely concerned I would not be able to love a baby as much as I loved Lina. Or worse – I would love the baby more than Lina, and Lina would be heartbroken. Lina was my everything. With all sincerity, I am happy to say I never had to share my love with Lina and my boys simultaneously. Though I miss Lina greatly and I can still be brought to tears thinking about her, Lina passed before my oldest child was born. Lina’s kidneys were failing. For a month or two, I gave her IV treatments of saline to help flush her kidneys and keep her with me longer. My vet adored Lina, and she told me I would know when it was time to let go. Saturday morning Memorial Day weekend 2004, I found my 13yr old Lina in the kitchen, and I knew it was time. Sobbing, I called my vet, who said she would come to the house around Noon to put Lina to sleep. Yes, my vet made a house-call, and I was grateful and touched. Lina died peacefully, though I was a blubbering mess. While Rob buried Lina in the backyard, my friend Michelle spent the afternoon with me at home, letting me blubber and sob at the loss of my love. Earlier this July, a friend of mine had to put down her beloved horse, Faith. When I heard the news, my heart ached. I shared the story of Lina with my friend, and I let her know that I truly empathized with her grief. The day she was to put Faith down, I had two candles burning in the beloved horse’s honor. I thought nothing of the support I provided my friend, because the support was sincere. And selfishly, by helping her let go of Faith, I was able to relive and talk about my beloved Lina. … then came the Dog Gone Good Contest. Inspired by a picture I saw on Jackie Cangro’s blog, I decided to have a dog photo contest. In the post announcing the contest I posted my very favorite picture of Lina. The picture was taken while we were living with Deaf Kitty. Unbeknownst to me, my friend (who is an artist) snagged the picture of Lina and went to work. Last week, I received an email from my friend asking me to reply back when I was sitting at my computer and ‘available’. I replied, and I anxiously waited to see what she needed. What followed blew me away. As I sit here now my heart is fluttering just thinking about it. Thank you, Laura. Thank you very much. Please do not forget to vote in the Dog Gone Good Contest. Beautiful. And she was so pretty!!!!! Wow! Animal lovers around the world unite in grief. You painted a lovely portrait of Lina all by yourself. And then Laura put it to paint. I love this post. Aw, sweet Lina. This was such an amazing post. I had to put my beautiful furball to sleep a year ago this past June. She was my cat version of Lina. Speaker7, I am sorry you had to put your furry friend to sleep last year, but I am grateful you had your own “Lina” in your life. Everyone should experience a “Lina”. Thank you for visiting and reading. She looked like the sweetest dog on the planet. It was so hard to read this post without tearing up. Made me think of my beloved dog, too. She died 20 years ago and I still think about her all the time. She was my best friend, my angel. This was such a great post and a beautiful tribute to your dear sweet Lina. Isn’t it amazing how much we miss those furry friends? MJ mentioned how they leave a pawprint on our heart. 20yrs later, Darla, and you still feel the pawprint of your pooch. I love that. I love that dogs give us so much unconditional love that is lasting. I can empathise with this post. Three months after my husband died we had to have his dog put down. The vet said he was pining for Bob and his body was giving up. The vet came to the house to put him to sleep on the couch. Oh Judith… three months after the loss of your husband?! Wow. That is sad and amazing all at once. Poor little pooch missing his human companion. I am not at all surprised. Our four legged friends offer so very much to us. The thought of your pup being put to sleep while on the couch sounds very peaceful. I am glad your vet made a house call. I am blubbering right now…just the thought of losing my Shelby brings me to tears. Your Lina was beautiful – and the picture by your friend of her has such a spiritual quality to it. Thanks for sharing these words and pictures. Ugh. I feel for you, Katy. I especially feel for you, because we grew up with Shepherds. I am brought to tears when I think about losing Wilbur and Cherokee. Why do our pups have to have such a short lifespan relative to ours?! They offer so very much to our lives. Thank you for reading, Katy. Hugs to you. I’m with Katy – blubbering away. This was one of the best tributes to anyone (animal or human) I’ve ever read, and then to end with the artwork! How perfect for such a special dog. Lina was beautiful; the picture of her in the leaves has won me over especially. rangewriter put it best. This is one of your best, most poignant posts, Lenore. Well done. 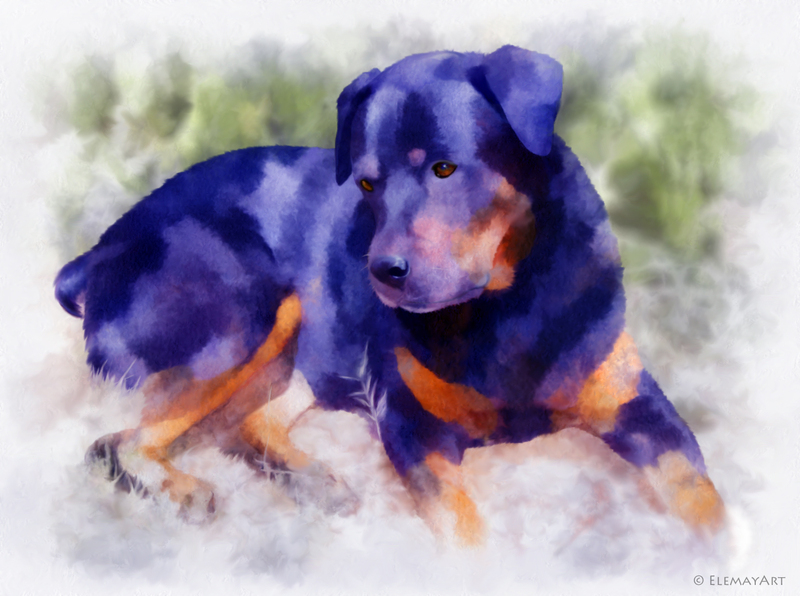 A beautiful tribute to a beautiful dog, Lenore. Thank you for sharing Lina’s story. Thank you for reading Lina’s story, Jackie. It was a long story to tell – I’m grateful the readers pushed through. (smile) I meant to hyperlink your name to your blog. I have since corrected that – Thanks again! Awww…a masterpiece indeed. Yes, I’m tearing up. Daughter #2 and SIL just put their 15 yr. old lab to sleep. Hard, so hard. I am so sorry D2 had to put down their 15yr old lab. You are right – it is so hard. My heart goes out to them. Thanks for reading my tribute to Lina and my friend, Laura, Georgette. what a beauty she was and we can see the kindness in her eyes. I know I would have loved her. No wonder you did. What a wonderful, thoughtful gift you were given. Pets leave their pawprints on our hearts forever and I can tell Lina has left hers all over yours. Tis true, MJ. Pawprints on our hearts, just like Frankie’s pawprint in the photo. Lina will always be in my heart. I am so very grateful to have had her in my life. Thank you for taking the time to read such a lengthy post. Love love love this…. I remember those days with bud.. They were truly entertaining. I remember coming to your house the day Lina left us. I actually think of it often…. Man… That was sad. She was an amazing person… Oops I mean dog. I miss her so much. She is with Bear in heaven ruling all of the other animals. I’m so pleased you read this, Michelle. I was going to email you a link. I will never forget you coming to the house and supporting me. Thank you very much. I am certain Lina and Bear are playing wildly. Aren’t we so blessed to have met those two awesome pooches?! Lovely. The loss of a beloved pet is a unique one. They occupy such a huge place in your heart! Thank you, SDS. Pets occupy such a huge place in our heart, because they offer so much unconditional love. Thank you for reading the long post. My eyes are full … and my heart is broken … for you, Lenore. Lina blessed me, Maxi. I’m forever grateful. What a beautiful tribute to Lina. The gas thing must be a German dog trait. Our dobermans could clear a room, and how. Thanks for sharing your story, Lenore. What a wonderful friend to create a painting for you! Isn’t it incredible, Patti? Her work is wonderful. “Blown away” was all I could say when I received her email. Thank you for reading the post. I am glad you liked it. I know people who have never had pets and they just don’t understand how very sharp the pain, how deep the loss is when we have to say goodbye to our pets. The word ‘pet’ just seems so inadequate. A beautiful tribute to your Lina. It of course brought up memories of my beloved kitty, Gomer Pyle, and how lost I was when he got sick and had to be put to sleep. And it was just on Monday night when my mother and I sat on the kitchen floor and watched her cat, Lucy, pass away. It was a blood clot and heart failure – sudden, unexpected, and very fast. You are correct, Leonore. The word ‘pet’ does seem inadequate. You’ve written about Gomer Pyle before, haven’t you? I’m sorry you can relate to the sadness, but isn’t it nice to have experienced such a wonderful companion? My heart goes out to your Mom. I am sorry she lost Lucy. Thank you for reading the post, Leonore. It was one of my longer ones. There was no way I was going to reduce the word count by sparing the part about her gas. After all, the campfire incident is still talked about with those who experienced it. That’s beautiful — what a wonderful thing to do. I love hearing about your Lina stories. I can tell how much she meant — and still means — to you. We used to tell Eubie to “go get busy” — that’s when she’d take her cue to use the facilities. Yes, the stereotype surrounding Rotties is that of aggressive and mean. But, the demeanor of a dog is really based on how the pooch is raised and treated. Thanks for reading, SIG. I know you’re a picture guy, and this was a loooong story. Beautiful tribute to Lina. I am glad to meet a person like you who value these innocent souls in animal skins to such an extent. Since my childhood we always have cats in our home. Now we have two dogs, many pigeons too. 🙂 This post made me emotional. Thank you very much, Arindam. I am grateful you open your home to the animals. They give us so much love.